Harper 800 Pound Appliance Truck with Belt Tightener made from a 16 Gauge robotically welded tubular steel frame for high load capacity. Equipped with an offset belt tightner with two piece poly belt. Non-marking snap-on vinyl facing and 6" Thermoplastic rubber wheels protect the load and floor from damage. Since 1940, Harper Trucks' mission has been to sell the highest quality products in the market. 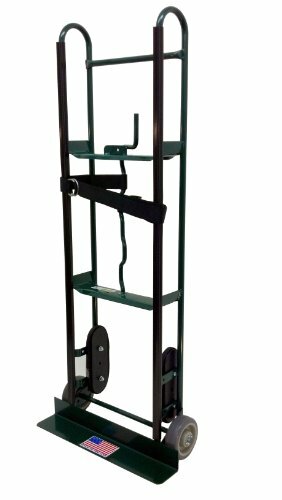 We have grown from a small, regional metal fabricator to the largest hand truck manufacturer in the world. As the world's largest manufacturer of hand trucks, Harper makes one of every three such trucks sold in the United States. Harper Trucks are manufactured in a plant of 400,000 square feet with full robotic and new composite-injection capabilities.